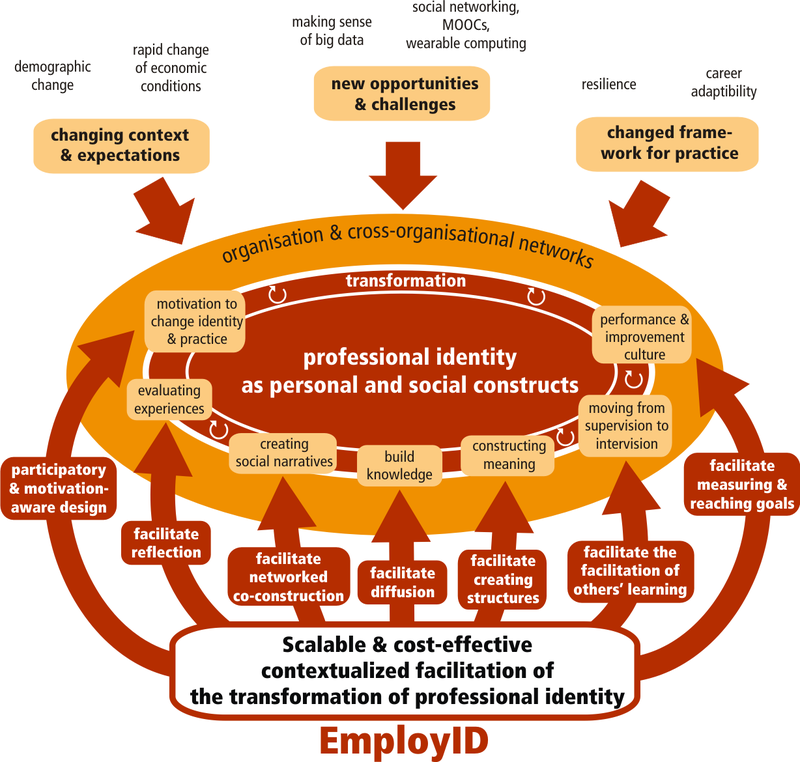 EmployID will deliver comprehensive, sustainable, and cost-effective support for the facilitation of professional identity transformation as a complex and continuous learning process, on an individual, organisational and European network level using a holistic tool suite combining and linking eCoaching, reflection, MOOCs, networking, analytical and learning support tools, leading to improved individual and organisational performance on employment counselling. It is expected that the project results will help PES practitioners to increase their efficiency and effectiveness by adapting to rapidly changing pressures and demands. It is also supposed to support PES organizations in effectively managing the up-skilling of their staff and delivery of key aspects of their services. The EmployID tool suite will based on open source solutions and include tools for reflection, e-coaching, creativity, networked learning structuring and measuring impact. PES across Europe are considered the main beneficiaries, but exploitation could reach beyond these organisations. In terms of training and capacity building special training material will be available for PES practitioners as well as IT providers of PES. A series of high quality MOOCs (Massive Open Online Courses) will complement the EmployID offer. A comprehensive and empirically validated indicator framework for PES organizations adaptable to their needs shall support the development of a performance improvement culture in the future. Continue reading about EmployID Theory and our Approach or see our short and explanatory video Overview.